His extraordinary output of choral and instrumental music embraced both his humanity and his intellectual genius. As with Handel, his instrumental suites include dance movements of the period. 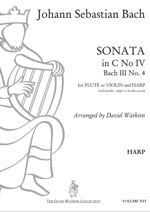 This Sonata is for the flute or the violin with keyboard accompaniment which also sounds well on the harp. 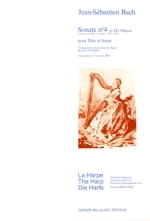 I have eliminated the last largo and minuet; they are rather weak endings for concert performance. Between the Andante - Presto and the brilliant Allegro, I have inserted a beautiful Siciliano stolen from another Sonata (4S1017).